The Dallas cocktail scene has come a long way in recent years as our collective palate has evolved. 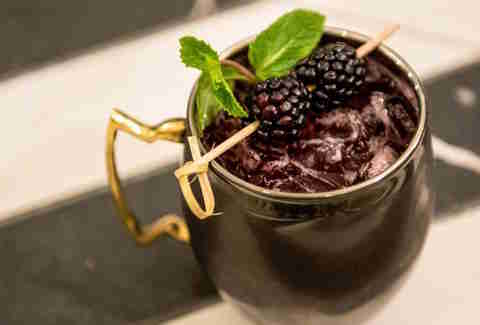 There were a lot of headaches from trying to winnow down this list of the area's best cocktail bars (headaches that resulted in more cocktails). 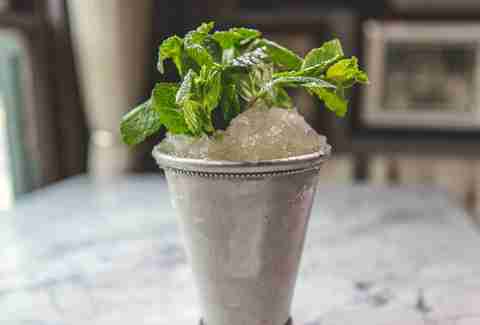 To find the best drinks in Dallas, look no further than these 15 establishments. Hearkening back to an era when life wasn't all about that fancy high-speed Internet and immediate gratification, Cedars Social puts thought, care, and quality into every cocktail and the difference is readily apparent. Expect fresh and house-made ingredients and an expansive cocktail list that evolves with the seasons, with selections like the Rio Star Rush (Plantation rum, falernum, orgeat syrup, grapefruit, Angostura). Of course, if you somehow don't see something you like (unlikely), the staff is quite adept at improvising on the spot. Eddie "Lucky" Campbell very well may be the best bartender in the city of Dallas (maybe the world) and Parliament provides the perfect backdrop to appreciate his talents. 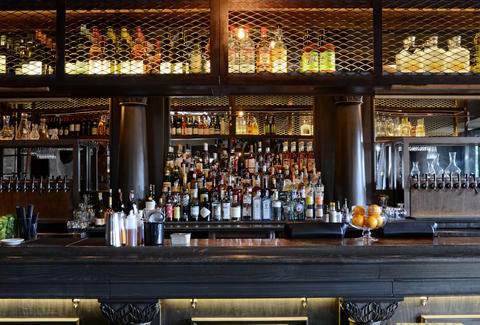 The bordello-lit drinking den with a lengthy leather-bound menu has something for everyone. If you appreciate history and cocktail artistry, maybe go for a Ramos Gin Fizz. If you appreciate a good deal, there's an incredible happy hour where you can score standards like Old Fashioneds and gimlets for $5 or so. If you have any sense, you're already drinking here regularly. 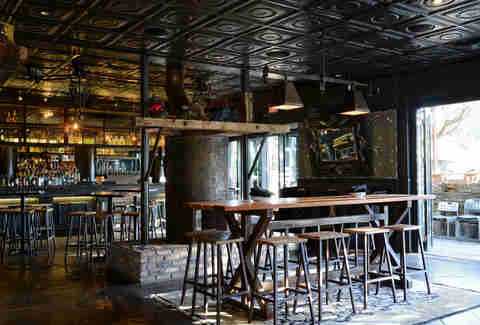 A relatively new spot, Henry’s Majestic is already making a big splash on the dining scene in Dallas. Much like Victor Tangos, while the drinks are top-notch at Henry’s, the food is a worthy draw all by itself (marrow-infused burgers and Texas pho, anyone?). But we're talking drinks. 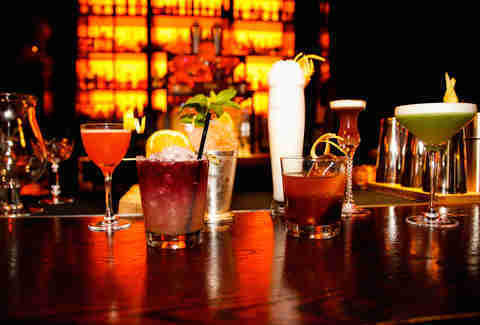 The $10 cocktail menu is populated with familiar classics given the slightest of twists, like a chile and maple Old Fashioned or a Manhattan kissed with saffron. If you happen to be here for brunch, don't miss the Bloody Mary made with Fresno pepper and cilantro-infused vodka. Drinks at this Downtown haunt lean pricey, but that speaks partly to the impressive combination of quality and intricacy that goes into each creation. For example, The Green Thumb has cucumber, basil, cracked pepper, garden simple syrup, and gin topped with soda and garnished with a basil leaf and cucumber slice -- the kind of summery freshness that tastes outstanding on the airy food deck. If you're staying awhile, you can sustain yourself with an impressively wide-ranging menu boasting everything from street tacos and steaks to fries and fondue. Victor Tangos takes its seasonal fruits and veggies quite seriously, and its cocktails reap the benefits (as do you). Take the Wet Hot American Summer, a beautiful blend of blanco tequila, watermelon water, grapefruit, lime, and cinnamon that tastes like nostalgia and summer in a way that Paul Rudd never could. If you're rolling with a crew, order up a punch bowl like like the Barbados Punch which has Barbados five-year rum, blackberry tarragon shrub, lemon, and ginger ale. Also, you'd be depriving yourself if you didn't explore the food menu, updated seasonally with dishes like sweet-tea marinated short ribs and ahi tuna nachos. 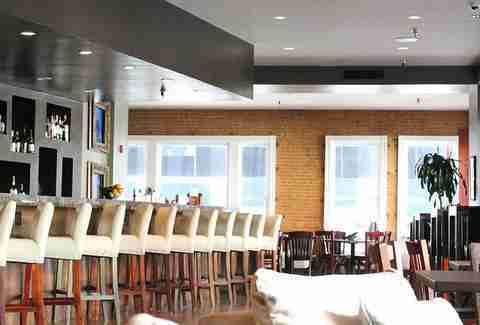 This low-key, sophisticated little gem is situated in the Joule Hotel -- which subsequently means you can also indulge in some of the culinary offerings from CBD Provisions. Midnight Rambler is the kind of place that makes a fine choice for a special occasion, or for more normal occasions like "I feel like drinking something amazing." One of the city's most creative cocktail program features drinks like the Perfect Prescription: rye, VSOP Cognac, Jamaican rum, French blanc vermouth, Italian vermouth with vanilla, Angostura & Peychaud's bitters, and lemon zest. Also, if it's that kind of night, don't skip the composed shots, like the Pho-King Champ which has wheat vodka, Oloroso Sherry, aromatized beef stock, a cilantro leaf, and an amazing name. Bowen House is another bar where you won't find an actual drink menu, you just simply tell your server what you enjoy, they relay the message back to the bartender, and voila! Out comes a drink crafted specifically for your taste buds. Located in an actual old house, probably where someone named Bowen lived, you sort of feel like you’re just hanging out at a friends sweet Uptown spot with a private bartender. Bonus: your "friend" also has some amazing chefs on call in his kitchen. Let’s be real here. Pick any "best of" Dallas list, no matter the topic, and Boulevardier probably belongs on it, but this one happens to be about cocktails, so we won't even mention the part about Boulevardier having some of the city's best, most inventive French food. Or how, despite being a little on the upscale side, it makes a burger that can stand toe-to-toe with the best in Dallas. We definitely won’t mention how it has all of your brunch needs and desires. Nope, we will just talk about how their cocktails are top-notch. The kicker is, Boulevardier doesn’t even really talk about its cocktails that much, it's just so good at everything that apparently its drinks get a little lost in the crowd. The best thing about the booze situation here is that the bartenders are extremely knowledgeable and can whip up a classic for you, or create an instant-classic on the spot with just a few questions about your preferences. Bolsa is a tried and true Dallas staple that has withstood the test of time, which in restaurant years means it’s been around for five-six. Bolsa keeps going strong, serving up stellar drinks like the Oak Cliff Creeper, which comes frozen with Cruzan rum, green Chartreuse, nopales, basil, and citrus. Or you could go with The Shepherd -- Mount Gay Extra Old, arugula, goats milk yogurt syrup, and lime. If the combination of innovation and execution keeps up, there's no reason Bolsa won't be around for another eternity (aka 5-6 more years). Charlie Papaceno (formerly of The Windmill Lounge), or “Charlie Pap” as most people refer to him, is known for making the perfect martini. It’s a good thing he is continuing to perfect his craft at Industry Alley. Quicker than you can say, “shaken not stirred,” in your best Sean Connery impression, he is ready to serve you his specialty or introduce you to a bevy of other cocktails from their list. The name is Pap, Charlie Pap. Let’s face it; cocktail bars can be intimidating. There’s a fear you might order the wrong thing, the music will stop, the mustachioed bartender will peer at you from the brim of their fedora, and laughter will ensue. OK, maybe that’s a little dramatic, but Eastwood’s vibe is anything but uptight. When you walk inside, it’s like you're stepping into your friend's living room except with much better drinks. Chris Henley (formerly of Bowen House) is behind their creative cocktail list and recommends the Set Sail to Barbados, which is Mount Gay rum, fresh-pressed lime, house-made passion fruit syrup, and Angostura bitters on the rocks. There are even a few TVs to catch games, so put up your feet, relax, but please keep your slippers on your feet. Sit on the patio for great people watching off McKinney Ave.
With Chef Graham Dodds at the helm, Wayward Sons boasts an impressive farm-to-table menu, so it’s no shocker that their diverse cocktail menu is just as impressive. Order one of their house cocktails, like the Doc Holiday, with George Dickel rye bourbon, Graham’s pecan syrup, and lemon. Don’t forget to check the out on a Thursday night from 8-11pm for live music on the patio. Parliament's Eddie "Lucky" Campbell’s new creation not only serves sandwiches with attitude, but the cocktail menu also packs a punch, we mean, knuckle. 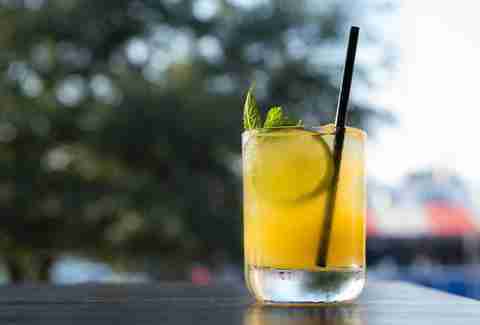 Try the Spiced Orange Smash, which is bourbon, orange, and mint. 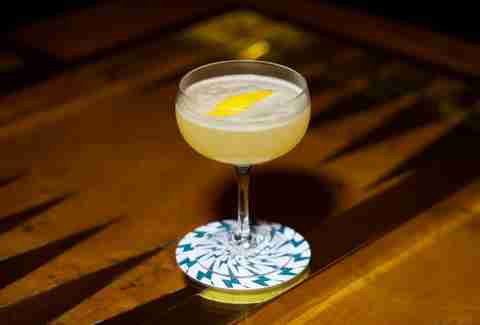 The drinks are simple but made with the same attention to detail that Campbell is known for. Besides aren’t the two key ingredients to happiness, a good drink, and a sandwich? We think so. This chic Design District nightspot is dripping with style and sexiness, and the cocktail menu is as handsome as the décor. 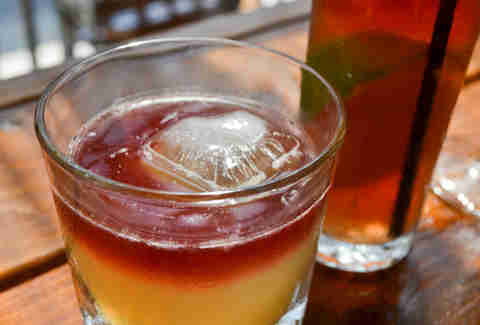 Not only can you come here to put the vibe out, but you can also sip on delectable cocktails, like the Flamenco, with brandy, red wine, pineapple juice, orange juice, and ginger ale. Just be sure to button that shirt up one notch Don Juan, you’re in Dallas, not Ibiza. The fellas behind Smoke are behind this dazzler at NorthPark Center, meaning now you can sip a truly excellent cocktail after hitting the shoe department at Nordstrom. 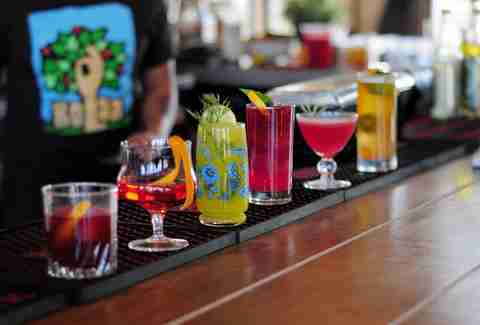 The bar program is the brainchild of Kyle Hilla, formerly of Bolsa, and all the drinks are named for national parks. Try the gin-based North Cascades with lemon and champagne foam, or try the Everglades, a tasty frozen treat with celery, lime, green Chartreuse, Cana Brava rum, and ginger pop rocks. David Maez is a writer at Thrillist who loves a good cocktail and a sandwich. Follow him here @davidfmaez.